I have to say it, this is one of my favorite pieces EVER! I would normally put sewing machine parts that I bought back together again. When I realized several pieces were missing though, I began to think of things I could make out of the parts I did have. A couple of years ago we went in and salvaged things out of a log cabin that was later burned down. There was a really nice, large cutting board that my son-in-law worked extra hard to remove. Doug is always so generous in lending a hand! Can I just ask though....don't you clean your cutting boards??????? I mean there are different ways to do it if you are afraid to wet it down good. I think an old fashioned way was to rub dough on it to get extra flour off, scrape it, then salt and lemon juice? This may have never been cleaned! I had to scrape, sand, and scrape some more, then use degreaser to get all of the gunk off....yuck! 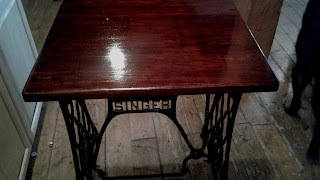 But it was pretty wood and still has enough marks and imperfections to go well with the cast iron legs. After I measured and drilled holes in the cutting board I bolted the cutting board to the legs. I countersunk the holes and added stainable putty so it would have a smooth surface, I wanted the top to be pretty dark. This piece is sold and will be used to display and photograph apparel, most of which is quite colorful, so I think it will make a lovely contrast. I used Minwax walnut stain, and then mahogany gel stain over that. I did repaint the legs and repaint the letters gold. I think she is a beauty! You did a beautiful job! 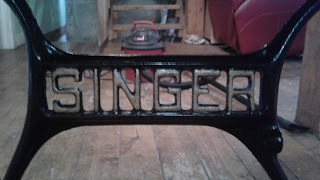 I have an old sewing machine in my garage that I am trying to get the nerve to redo! Thank you so much Laura! I am delivering this project today, this is one I really hate to see go! She is quite the beauty! Thanks Donna! It was hard to let this one go! Thank you so much Kari, and thanks for the invite, I will come over and link up! Love this it looks so great and it would have been a shame to let it go. 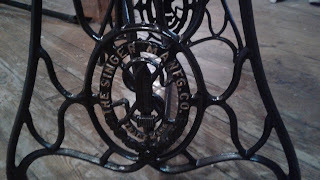 I always go crazy when I see sewing machine legs. There is just something about them. 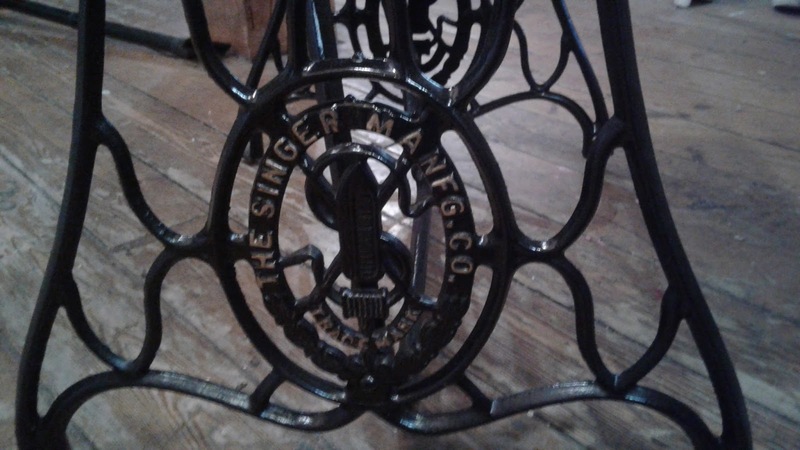 My grandma had a singer sewing machine with these kind of legs, it was one that you could close up nicely and store inside a cabinet. I'd love to have it now. 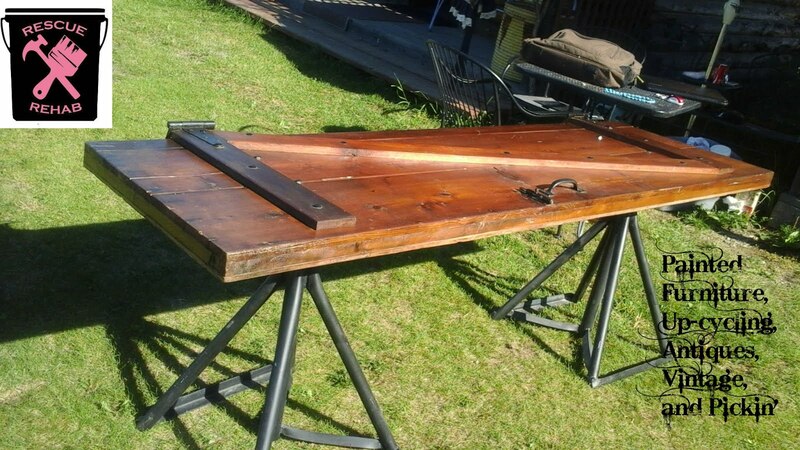 Your table turned out beautifully, I love the table top [cutting board] ! Thank you so much for sharing at Sweet Inspiration #2! Thank you so much Katrin, great link up party! Thanks so much Diana! Thank you for a great link party, I enjoy your blog so much! We still have my Great-Grandmothers sewing machine like that and it still works. Beautiful job. 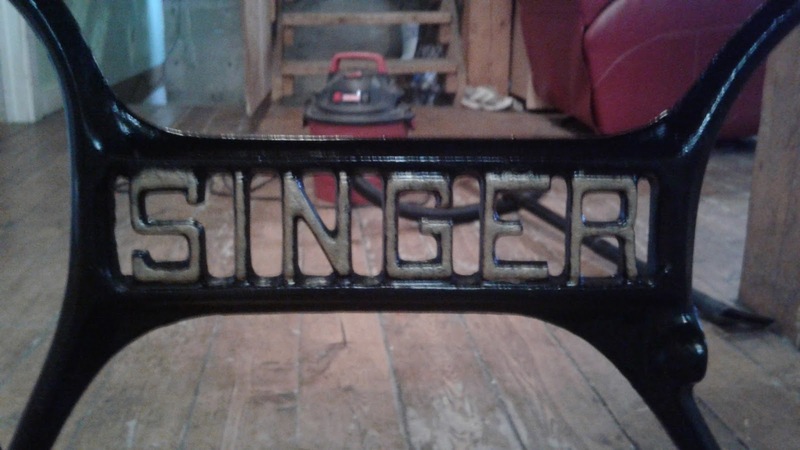 I recently did a singer and used rub-n-buff (turquoise) for the letters and it wasn't until after I sold it that I realized I didn't do the SINGER in the middle. duh! Yes she is a beauty, nicely done! Thanks for entering the $10 reader challenge! Oh how I love a Singer sewing machine table redo - nicely done! Thank you for linking it up to our Power Tool Reader Challenge!